She hands him to me and he fits perfectly in the curve of my arms. I feel the warmth of his head and the weight of his body. He tenses up and wrinkles his forehead. His fists sway near his face in that uncontrolled manner of the newborn. Some ancient motherly instinct kicks in immediately and my body moves its familiar dance. Sway. Rock. Tap. Tap. Tap. His small body relaxes, his face calms and his hands settle quietly in a perfect pose against his faultless cheeks. There is nothing like holding a baby. As I take in everything about him, my sweet nephew, I start to feel that ache from deep inside scream out to me again. My daughter and son run by in a rush of swords and energy. They sweep through the room and they are so loud. He wrinkles up his forehead again as he takes in the kids he will someday play with. They run out screaming battle cries and erupting into laughter. I focus on the beautiful new life in my arms and all at once it becomes too much. The reality of that hits me hard in the stomach and I fight back tears. I know in my heart that I am blessed more than some. I had two amazing pregnancies and births. I held, slept and nursed my babies constantly and I don’t regret a single second of any of it. I got to experience all the joys of babyhood. There are those close to me that have never had the chance, some whose path to motherhood was anything but easy and others who have given up all hope. My heart breaks for them and the injustice of it all. Soon my mind is racing with crazy possibilities. Surrogacy. Vasectomy-reversal. Adoption. Become a midwife. Foster kids. I grasp toward anything but acceptance and peace. Quiet down, I whisper to myself. The baby shifts in my arms and I lean down to kiss his soft head and take in his smells. He makes cooing noises and I smile. I look at my sister and her husband and they are positively glowing. This is their time. Their journey is just beginning and it makes me so happy. I think about all the joys and struggles ahead of them and my heart feels like it will burst with excitement. 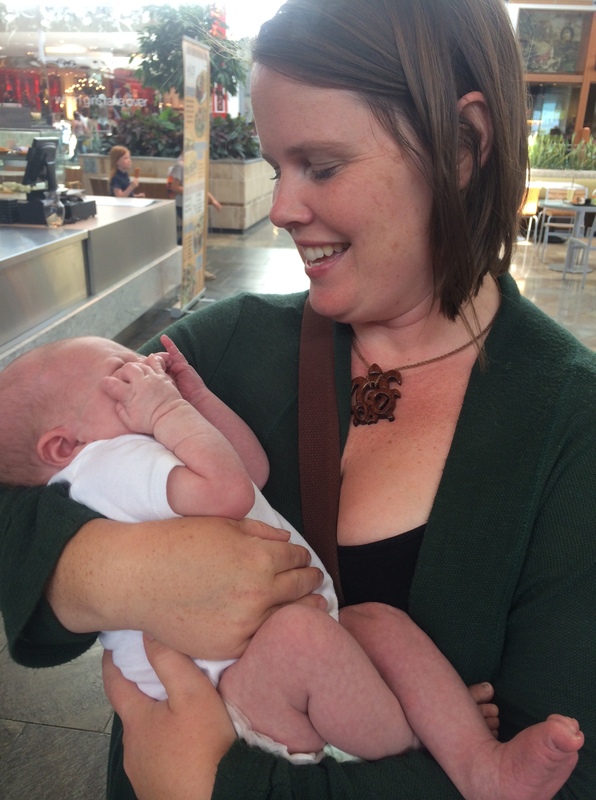 There is nothing like holding a baby and I’m filled with gratitude toward these young, new parents. They drove over so I could hold him and they delight in sharing their bliss with me. He stirs in my arms and I know that others are waiting a turn to hold him. Just one more minute, I plead. My arms are empty again and they ache so much. My yearning is deep, primal and painful. It fills me with such a sense of loss that I find it impossible to explain or convey to my husband. I know the acceptance will come. It must. But today, alone in my quiet bedroom, I’m going to let the tears flow. ❤ your posts are so beautifully emotional, you bring me with you. I teared up reading your post. I’ve had those same feelings and as a 55 year old mom of 2 nana of 1, they never really go away. There is so much truth in those feelings. We were born to be mothers. I am a mom of 4, and grandmother of 8. I am grateful everyday that I was able to have all the children I wanted – in spite of super difficult pregnancies. I absolutely 100% understand this and your ache!! Oh, how I do! It happens to me too and it takes my breath away – almost knocks me to my knees – all I know to do is pray for peace and remember how blessed I am with a son and daughter! I loved reading this today! Every time I think “I will never have another baby”, I remember how the 7 years felt when we were trying and failing to conceive. My heart goes out to those who never will. 3 lost by 16 weeks, and can never have any now. It is the most haunting, drawing pain of all. I understand the aching arms. So sorry Joanna. My heart aches for you. Sending you love. You will be able to enjoy watching other new parents, like your siblings, grow as parents, and be a part of that. Two wonderful blessings and probably a grandparent someday will give you more joy. I understand the longing for another child, losing a child, and accepting that there will not be another one in the future. Having the two that I do, has blessed me in so many ways. I thought I was a very patient person until I had children, then I realized that I had to learn the art of patience. The realization of a new level of understanding and new stage in life, gives us more growth, and the ability to help someone else along the way. Oh, man. My baby is nine months old. Is it pushing it to call the tears I leaked reading this beautiful post “postpartum?” I’m so grateful for my two, so happy. And still I would have 20 of them if I could. It goes so fast. Hackneyed but true. Hi, a small note of thanks for writing about how you feel about not having another child. So many don’t get it. I too am blessed with 2 beautiful now young adult children. That ache is still there. It’s hurts a bit at times. I’m 47 and we both know I’m not going there. Grand kids are just a little time away I’m hoping. My daughter soon to be 25 is not sure she can have one she tells me. A lot of medical issues it’s crazy nothing like that on my side of family. I’d carry one for her if I could…. Am I crazy to think that? I’m sorry to babble on but your blog which I found thru Facebook made me smile big time tonight. Your photo story hits home too. I loved it. My son 23 told me recently that I was a hot mom… Lol totally made my day. Thought I’d share . I promis to look again at your page as you seem like one wicked cool mom who gets it. Hi Bridget, I’m so glad I found your blog! I love your style of writing and the raw emotion that many mothers can deeply connect to. Please carry on writing these beautiful blogs and have a very wonderful day! Wow. I clicked on the link to your blog just now because I saw the photo your son took, which you wrote about… powerful! But I never imagine your the post I would see would be exactly the subject I have been struggling with for the past 3 years. Extreme sorrow and regret over agreeing to my husband’s vasectomy. We have 2 beautiful daughters. I have been fighting to enjoy the beautiful human beings who ARE under my care, instead of longing for that baby I don’t have. It has definitely been hard to describe to people, and I never thought others have felt the same way. But I love that your goal is acceptance. Many who I have tried to confide in keep telling me, “well, go out and get what you want then…. try to reverse the vasectomy, adopt, etc, etc.” But for many reasons, those options don’t seem ultimately right at this point. Peace and acceptance seems right, though the most challenging. Thank you for your words. Beautifully expressed. Reading your blog makes me feel “normal”. I actually have the same “issues” as someone else – same fears (weight, being a mommy) – same sadness (never being a new mommy again). No one ever told me how beautiful yet sad life can be nor how amazing and poetic. Thank you for this blog. Hi, I happened on your blog about “Exposed by my children” I stayed to read more. I am that woman who will never hold a baby of her own. I am that woman who has struggled with her weight all her life.The feelings of never quite being good enough. Let me say that you are a beautiful soul. You are raising wonderful empathetic children. You touch my soul. Thank you very much for putting it all into words. I look forward to reading all your blogs. I had my first and only son at 40, and he’s 5 now…I’d love to get pregnant again, but it hasn’t happened. My arms ache too. Love to you. You have a way with words. Beautifully written! I don’t normally comment on blogs, but this really captured something I’ve been feeling. I am actually expecting my second baby (today’s the due date actually). I am SOO excited, but one thing I can’t helping thinking is that this will be my last baby. Seems so final and I’ve found it hard to accept. So, thank you for your post. Four years later, my husband was killed on the job. A new man came into our lives, and with him, I bore one more child. I delighted anew with the smell of baby wash and baby breath. I was twice blessed. I married a keeper and each of my “big” kids came to love him as deeply as he loved them. Thirteen years ago, I was “spayed.” I’d had two unplanned pregnancies after Baby #4, both of which ended in miscarriage and broken dreams. I finally really was “done” having babies, but, as you know, the ache doesn’t just disappear. Sometimes, even though I am over 50 now…and barely have energy for a puppy, much less a baby 🙂 , I still yearn for those days of baby snuggles. The first laugh. The first word. The first step. Funny how we forget all the diaper-explosions, sleepless nights, high-fevers, and etiquette lessons! It’s a little like forgetting the work of labor. Yet, seasons end and new ones begin. Now I delight in my grandchildren, and watch as my eldest daughter navigates the waters of motherhood. Some days it’s a gentle stream. Other days, a roaring river. Thank you so much for sharing your longing. I think you have struck a near universal chord among those of us who are mothers, and those who long to be. You’re an inspiration to all of us. I have a 24 year old daughter with mental illness. I shamefully mourn the loss of the child I imagined having. We all need to count our blessings and be kind to each other along this journey. Keep writing these beautiful words. Do not feel shame. You are only mourning the loss of the that you know for yourself that you want for your child. You are not ashamed. You must be so proud that you are able to write your words. What a brave and beautiful person you are. And your child will bring you more joy that ever imagined and open doors that you never dreamed possible. Bravo to you and your child. (aren’t we all a little bit mentally ill anyway?) find the sweet and whole in the in between, and focus and find joy in that. This was so beautiful. I am one that had a hard time getting pregnant. Thank god for fertility pills. I could only have one child. She is now beautiful 25 year old mother of two and expecting her third next March. I only got to enjoy one child of my own but she gave me two wonderful grandchildren with the third on the way. She allowed me to be there when the first two were born and probably will be there when the third and last one is born. When I held them for the first time tears just streamed down my face. I was the most wonderful feeling in the world. Be a mother might be the hardest job in the world but it is also the most rewarding job in the world. I miss my daughter at those young ages. But she just sent me a text that said she loved me as much as she did when she was little or even more. That brought tears to my eyes too. I thank god everyday for my wonderful daughter and grandchildren. Never before have I posted because of anything except kids and grandchildren. I am so moved, even before I read very far. What a beauty we women are. What workers, miracles. Beauty. You write like a saint. Keep on giving your beauty, which has nothing to do with how we look to others, but your external beauty is so grand. I am a mother of 3 daughters and a grandmother of 10. I am only now, with all of the sags and hangs, seeing the real beauty that I am. Soft and full of love. Ready to share and give. What a beautiful person you are. You are a good person. Oh I followed you also about the picture the kids took of you..You are a true mother.. I am 53 and have a 32 and a 27. Both are the love of my life. My 27 year old has had cancer as a 3 year old and was diagnosed with mental illness at 17. Yes the days are hard but a blessing also. I ache for the time I didn’t get to spend with my babies … they grow up so fast and making a living got in the way ..Also had a mentally ill husband. I would have liked to had more but it just wasn’t God’s plan. You are a beautiful writer and capture many of my same struggles…and I’m a bit further down life’s path. Weight conflicts/acceptance. Infertility but one amazing daughter and a hunger for more that launched me into a teaching career. GOD is good; life is tricky; I choose “half full.” Thanks for some touching reading. I know the feeling too. I SO wanted a third but blessed to have 2. I didn’t marry till 40 and thankfully easily got pregnant at 41 and 44. 2 healthy preterm babies (1 at 3 pounds and 1 at 4 pounds). Menopause hit me at 49. Shop closed. I am now 50 with a 6 and 8 year old and so thrilled to have my babies. I always knew that all I wanted was to be a mother. So very very beautiful. A sentiment , ache and sadness I can relate to. Thank you. For you words. Thank you. The feeling of holding a new life never changes no matter how many times it happens. Your description is spot on! As a nurse I have had the opportunity many times & the sense of wonder & joy has never gone away. Your story about your daughter asking you if she is “weird” so touched my heart..SHE is special tooooo,even if she is different, does not like dresses, like dragons, thats OK..because that is who SHE is,, support her, be good-trughtful-loving to her. I tooo have fought weight all of my life, I hate it but I am learning to accept me, I know inside me there is a loving,caring,supportive,special person….if someone has a problem with my “outer shell”, dont know what to tell them!!!!!!! I have felt your words. I have been in that moment. It lasts a long time and the tears will flow from time to time but there does come a moment when those emotions become less raw and you accept that the next child you will hold extensively will be your grandchildren. (((hugs))) to you Mama!